Heavenly International Tours specializes in Brazil tour packages from South Africa. Based in Johannesburg, South Africa, we are an exclusive tour operator specializing in travel to Brazil, Argentina, Chile and South America for over 16 years. 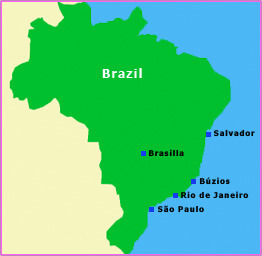 Brazil is, first of all, Portuguese America which rebuilt a one state country after its proclamation of independence in 1822. Five centuries of immigration proceeding from Europe, Asia and Africa established an unique ethnic and racial melting pot when meeting the natives. It offers a wide range of possibilities according to each different region . Rio de Janeiro and sorrounding area stands out in the Southwest with beautiful beaches, excellent accomodation facilities and natural landscapes that together with Carnival are well known features of this country’s identity abroad. On the other hand, Sao Paulo is the most important financial and industrial centre in this region. The Northeast shows the lively African heritage being the first area where the Portuguese came ashore. There is an impressive coastal area to enjoy including Salvador de Bahia, Maceió, Recife and Fortaleza displaying also their barroque architecture, typical gastronomy, music such as “frevo” and “capoeira” dance along with carnival tradition.